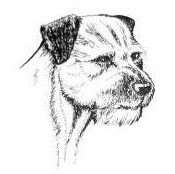 A curate's egg day with some great border terriers and some disappointments too. My winners were typical and not only had the heads to win but moved soundly and had the coat and pelt so desirable in the breed. On the downside, although bites were generally good, there are too many with pathetically weak teeth and several with shoulders set too far forward so they looked narrow but had no fore-chest at all. A terrier needs fore-feet under its chest. I was looking for borders that were soundly made and could therefore cover ground and I found them but there are some with short choppy actions. However I do not intend to be too pessimistic for the breed put on a good show today and there were some really promising youngsters in the puppy classes. Thank you to those who exhibited dogs with the typical thick harsh coat and pelt, these were all much appreciated. 1 Wrenn & Langdons' Dandyhow Douglas Fir, 8 m.o. Has breadth of skull, muzzle slightly long at this age. Good reach of neck with well placed shoulders, narrow front and sufficient bone. Nicely turned hocks and moved out well. Slightly long cast but maturity could change overall picture. Nevertheless, good overall balance. B/T coat not at its best. 2 Haughton's Chorbeck Charlie Chaplin - 8 m.o. Strong headed dog with dark ears and deeper stop than 1. Good thick pelt, well coated at difficult stage making appearance appear heavy. Came to hand OK. Well made and thus good reach and drive on move. 1 Docwra's Bandicoot Double Take, 11 m.o. Longer cast type in good coat, moved smartly but indisciplined in front. Broad flat skull, has muzzle strength and attractive expression. Good reach of neck with attractive flow into shoulders. Slightly heavy ear and deeper stop decided the BP challenge. Coat and pelt good, tail OK, neat tight feet. 2 North's Northborders Mr Pickles. 10 m.o. Much to like with strong head thoughout, reach of neck, good construction, flowing lines piture completed with a harsh B/T jacket and pelt. However not shown to full advantage. Flat feet, heavier build and lack of muscle tone cost him top spot. 1 Wallace's Hobholt Helmsman JW. 14 m.o. Overall good head and expression, ear carriage needs to settle. Coat approaching end but harsh with thick pelt. Straight front, good shoulders with appreciable length of body. Good turn of stifle. Tail set on well. Conformation translated into good movement. 2 Sneddon's Chesterton Top Hat And Tails By Kersfell, 17 m.o. Smartly presented with strongly made head showing strength throughout, larger ears than 1. With reach of neck and sloping shoulder a greater turn of stifle would complete the picture. In hard condition and moved well . The harsh jacket was pleasing. 2 Wildey's Brumborder River Skipper, Good head and expression, Heavy in ear and low set. Shoulders well made but wider front than winner, hindquarters lack muscle tone. Moves with drive when allowed to. Excellent coat and pelt. 2 Lowry's Ravenside Ballymoss. Close up with good skull, strong muzzle, reach of neck. Heavier ears than winner, neat tight feet and moves with drive. 2 Axford's Barterhound Rhinestone, 7yrs Head lets him down but placed here on soundness and conformation. Fit with tight feet. Excellent coat and pelt. 1 James' Golden Rosa At Blackmine -Many promising youngsters. Top five all have a future. Winner is mature 7 m.o. with broad skull, strong muzzle and excellent, strong, white teeth. Would prefer slightly higher ear set. Correct reach of neck, well ribbed back and lovely bone. Narrow with fore-chest. Balanced overall and not overdone, well made construction all round. Neat carrot tail. Moves well. 2 Scale's Doramil Camorra - 8 m.o. Similar in style and quality to winner. Broad skull and liked the strength in muzzle. Preferred maturity of 1. Moved well, neat tail and excellent harsh jacket and thick pelt. 1 Pickerings' Picer Hildora, 11m.o. Beautifully made mature puppy with a typical head, good breadth of skull, strong muzzle with dark ears. Ears slightly heavy. Good straight front, plenty of bone and constructed nicely in shoulders and stifle. Moves with reach and drive. Thick pelt and harsh jacket with a neat, short carrot tail completing the picture. Stood out in the class. Best Puppy. 2 Matthews' Tojamatt Isolde, 10 m.o.B/T with broad skull, larger ear than 1. Overall conformation is good and moves out well. 1 Docwra's Bandicoot Jazz - Stood out in the class. Broad skull, muzzle OK feminine expression, ears OK. Coat harsh, well presented but nearing end . Neat feet and feminine lines throughout. Nice length of body and nicely angulated in stifle. 2 Thomas' Benattivo Gem Stone For Daluce. Great to see a full coat both harsh and dense..Neat ears and attractive clear cut lines. Slightly longer cast than 1. Moved close behind.. Good carrot tail, preferred overall proportions and length of leg of 1. 2 Highams' Ir Ch Comberdown Rosalie CJW'10 Ir J Ch- Strong head, neat ears well set on, lovely reach of neck. Up on the leg, and strongly built. Spanned readily and moved out well. Preferred the feminine lines of 1. 1 Hyslop's Rubicon Raincloud Sh CM- 7+yrs, relative youth made the difference today. Good strength in skull and muzzle, slightly heavy ears but overall made well, nice ribbing and moved well. Slightly longer tail than I prefer. 2 Hardman's Bonosue Queen Of The Nile Sh CM, 11yrs, Still looking good for X years, Head OK, clean lines, well ribbed, easily spanned and moved well.